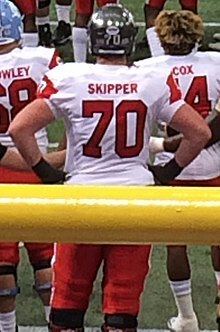 Dan Skipper (born September 20, 1994) is an American football offensive tackle for the New England Patriots of the National Football League (NFL). He played college football at the University of Arkansas. Skipper was born in Arvada, Colorado, a suburb of Denver. He played football at Ralston Valley High School, where he earned 5A all-state recognition as a senior. During his senior season, he helped get Ralston Valley to the state semifinals. Skipper received numerous scholarship offers, ultimately choosing the University of Arkansas. As a freshman, Skipper played in all twelve of the Razorbacks' games, starting eight. He blocked three field goal attempts, a school single-season record. He was named a Consensus All-American. As a sophomore, Skipper started all 13 games of the season and earned an Associated Press All-SEC honorable mention. As a junior, he started all 13 games and was named to ESPN's All-SEC team. As a senior, he made the All-SEC team of ESPN, Phil Steele, Athlon Sports, Lindy's Sports, Sporting News, and the Coaches Poll. Skipper went undrafted during the 2017 NFL Draft. It was speculated that he went undrafted due to a chronic blood condition that was discovered during prospect evaluations. After not receiving a contract as an undrafted free agent, Skipper received an invitation to attend the Dallas Cowboys' rookie mini camp as a tryout candidate. On May 16, 2017, the Dallas Cowboys signed Skipper as an undrafted free agent. Throughout training camp, he competed for a roster spot against Emmett Cleary, Clay DeBord, Ruben Carter, and Kadeem Edwards. On September 2, 2017, he waived by the Cowboys and signed him to the practice squad the next day. He was released on September 20, 2017. On September 25, 2017, Skipper was signed to the Detroit Lions' practice squad. He was promoted to the active roster on October 26, 2017. On October 31, 2017, he was waived in order for the Lions to sign Don Barclay and was re-signed to the practice squad. He signed a reserve/future contract with the Lions on January 1, 2018. On September 1, 2018, Skipper was waived by the Lions and was signed to the practice squad the next day. He was released on September 5, 2018. On November 27, 2018, Skipper was signed to the Denver Broncos practice squad. On January 8, 2019, Skipper was signed to the New England Patriots practice squad. Skipper was a part of the Patriots Super Bowl LIII championship team when they defeated the Los Angeles Rams 13-3. He signed a reserve/future contract with the Patriots on February 5, 2019. ^ "NFL Draft Profile: Dan Skipper". nfl.com. Retrieved January 19, 2018. ^ Kevin Casas (July 18, 2017). "No tall tale, 6-10 rookie Dan Skipper still hanging with Cowboys". star-telegram.com. Retrieved January 19, 2018. ^ Eatman, Nick (May 16, 2017). "Cowboys Waive 3 From Roster; Sign 2 Tryout Players; More Moves To Come". DallasCowboys.com. ^ K. D. Drummond (June 17, 2017). "Cowboys 2017 Post-Minicamp Roster and Depth Chart Projection: Offense". cowboyswire.usatoday.com. Retrieved January 19, 2018. ^ Eatman, Nick (September 3, 2017). "Showers, Drafted CB & 2 WRs Headline Cowboys' 10-Man Practice Squad". DallasCowboys.com. ^ "Cowboys sign Jarron Jones to practice squad, release Dan Skipper". 247sports.com. September 20, 2017. ^ "Lions sign T Dan Skipper to practice squad". DetroitLions.com. September 25, 2017. ^ "Lions sign T Dan Skipper to active roster and T Storm Norton to practice squad". DetroitLions.com. October 26, 2017. ^ "Lions sign free agent G Don Barclay and waive T Dan Skipper". DetroitLions.com. October 31, 2017. ^ "Lions sign three players to practice squad". DetroitLions.com. September 5, 2018. ^ Swanson, Ben (November 27, 2018). "Broncos promote Temarrick Hemingway to active roster, place Jeff Heuerman on injured reserve, sign three to practice squad". DenverBroncos.com.